What Explains the Cambrian Explosion? Forty major animal groups appear out of nowhere at the bottom of the fossil record. Where did this “Cambrian Explosion” come from? When Charles Darwin published On the Origin of Species in 1859, he considered the Cambrian Explosion one of the most significant challenges to his entire position. Why? In Darwin’s view, species arise from other species in small steps over long periods of time. The more different two animal species were, the more evolutionary steps and the more time would be required to connect them. He also thought that all animals evolved from a single ancestor along an animal “family tree”—species producing new species, similar to families producing the next generation in a human family tree. Unexpected Variety—At the lower fossil layers, known as the Cambrian, is an incredible variety of sea creatures without any ancestors below them. This sudden appearance of variety is a mystery to evolution, which would expect species to arise in small steps over long periods of time. With animals as enormously different as the trilobites and brachiopods (e.g., lamp shells) found in Cambrian rocks, Darwin inferred that an enormous amount of time and many, many generations of species must have come before the Cambrian (roughly “442 million years ago” by secular radiometric dating1). So why weren’t any ancestors of these animals found as fossils in the Precambrian? Darwin suggested the fossils had been formed, but that they had long since been eroded away. Since in most places rock really was missing between the Cambrian and Precambrian (such as Grand Canyon’s “Great Unconformity”), Darwin’s idea seemed reasonable. So the search was on to find the missing fossils. Precambrian rocks were searched for fossils, and the world was searched for a place where Precambrian rocks had not been eroded away. So what has been the result of 150 years of searching? A more explosive Cambrian Explosion! The missing rock layers were found in about a dozen sites around the world, and fossils were finally found in Precambrian rocks worldwide. But the fossils were not as expected. Precambrian fossils included bizarre organisms too different from Cambrian animals to be their ancestors, as well as fossils of bacteria and even microscopic animal embryos (mostly sponge embryos). But the ancestors of the Cambrian animals have never been found. If the rocks were able to preserve single cells, they could have preserved any animals that were really there. 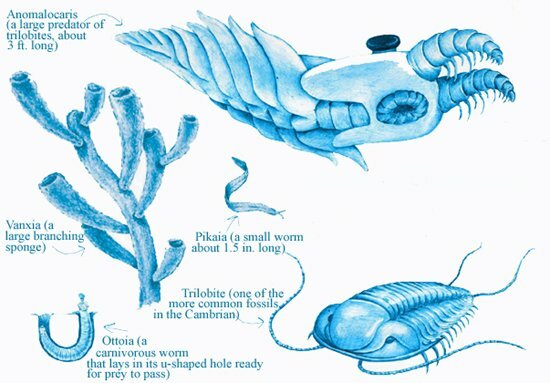 So it would seem that the Cambrian ancestors never really existed! New Findings Raise More Questions—In Charles Darwin’s day, scientists had not yet found any ancestors of the animals in the Cambrian fossil layers. After 150 years of searching, we now know that no rock layers are missing, and the variety of Cambrian animals is even greater than Darwin knew. How did so much variety arise suddenly? In other words, if all animals did evolve from a common ancestor, the main branches of the entire evolutionary tree of animals must have evolved before the Cambrian. It isn’t just the ancestors of trilobites and brachiopods that are missing; it’s the ancestors of all 30–40 major animal groups (phyla). This makes the Precambrian rocks even emptier and the Cambrian rocks even fuller than they had originally appeared! The Cambrian has another problem: too few species. In our everyday experience, if we meet two Americans who are twelfth cousins and descendants from the same immigrant, we expect to find many other living American descendants who came from the same immigrant. For similar reasons, if we see very different animals in the Cambrian, we expect to find many, many other closely related species. But we find far fewer species than expected. Measuring time in millions of years has worsened things even more. Radioisotope dating used to spread the Cambrian Explosion out over 100 million “radiometric years,”1 but refinement of the methods has shrunk the explosion to something on the order of about 10 million radiometric years or less. Above the Cambrian rock layers we find other animals that differ from the Cambrian animals as much as the Cambrian animals differ from one another. Yet these creatures are dated more than 100 million radiometric years after the Cambrian. If evolution were true, then, in the Cambrian Explosion at least 100 million radiometric years of “normal” evolutionary change had to have occurred in about 10% of that time. Since evolution can’t explain the Cambrian Explosion, what can? By starting our scientific investigation with a firm faith in the truth of the biblical account of the flood, scientists can find a solution to the Cambrian Explosion, which is so mysterious within the evolutionary perspective. Burying sea creatures on a worldwide scale could be the work of a global Flood. This would also explain why we see animals from most of the crown groups but relatively few species. If we look around the world today, typical environments contain examples from most crown groups but relatively few total species. If the Flood buried only one environment at a time, then each layer in the fossil record reflects the mix of crown groups and species from one environment. Then why don’t we find many fossils below the Cambrian? The earliest stages of the Flood, when the “fountains of the great deep were broken up” (Genesis 7:11), were apparently very violent. Many creation geologists believe these early stages of the Flood shaved most of the pre-Flood sediment off the ocean floors. This would have destroyed most of the fossils that had formed in the pre-Flood world. Then, only after the violence of the waters had partially settled down, would the sediment and freshly killed sea-dwelling organisms begin forming the first sedimentary rocks and fossils from the Flood (the Cambrian rocks and fossils). So only rarely, if at all, would pre-Flood fossils be expected beneath the earliest Flood rocks. Fossils are filled with mystery. They are commonly used to attack the biblical worldview, but in reality the Bible gives us the keys to help us solve these mysteries. How could recently discovered dinosaur tissue have survived until today? Why is the first fossil layer filled with such an astonishing variety of life (“the Cambrian Explosion”)? 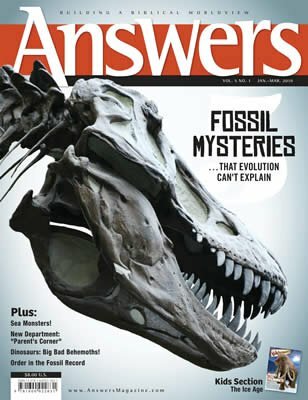 Read this issue to understand these and other mysteries of our world! Even though nothing in the creation is more than a few thousand years old, fossils are typically given ages of millions of years. The larger numbers arise from a particular interpretation of radioisotopes found in rocks—an interpretation based upon incorrect assumptions about the world and its history. Under these incorrect assumptions objects only years or weeks, or even minutes old, can be assigned ages of millions of “radiometric years.” See Andrew Snelling’s “Radiometric Dating: Making Sense of the Patterns,” p. 72.